Another successful event! The 4th LV workshop and the Thames Valley Chamber of Commerce energy seminar were held at the university of Reading on the 1st and 2nd of March. This two-in-one event aimed to share recent developments in demand forecasting and energy storage control, and bring the academics and industry together for discussions and collaboration. Below is a summary of the presentations given during the 4th LV workshop and the TVCC seminar. 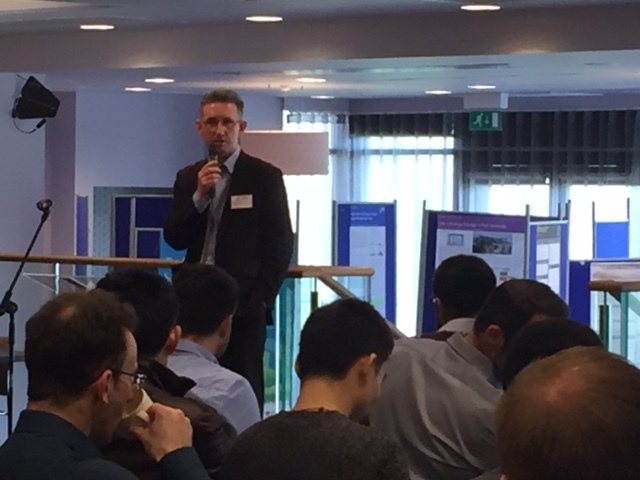 In the continuation of the theme of the previous workshops and close links with the New Thames Valley Vision (NTVV) project, the 4th LV workshop aimed at the academics working on the applied research on demand forecasting techniques and energy storage control in the Low Voltage (LV) networks. The first day was dedicated to forecasting techniques for power systems, starting with demand forecasts at the national level and then focusing on demand at the LV feeder and house level. Dr Jeremy Caplin (National Grid) gave an informative and fascinating presentation on the state-of-art forecasting of the electricity demand at the national level, including an insight in to how weather and major events impact both, embedded renewable generation and demand. Dr Stephen Haben (University of Oxford) and Dr Laura Hattam (University of reading) presented on the forecasting techniques for demand and loading from Low Carbon Technologies at the LV level developed for the New Thames Valley Vision (NTVV) project. Stephen’s talk highlighted the complexity of forecasting at the household and the feeder level driven by the range of customer behaviours and the temporal range of the forecast. Laura’s talk focused on forecasting the uptake of Low Carbon Technologies (EVs and PVs) as clusters and modelling the uncertainty of their output. Dr Florian Ziel (University Duisburg-Essen) presented and compared several short-term forecasting techniques for LV feeders, focusing on how feeder size impacts the accuracy of the forecasts and the sensitivity of forecasts to temperature. Dr Kavin Narasimhan (University of Surrey) presented how concepts from social practice theory have been applied to agent-based modelling of energy demand at a household level. The concepts are based on three components of social practice (meaning, skill and material), linking the activities with energy usage and validating how the relationships between activities and energy usage change the over years. The second day of the workshop focused on energy storage from two perspectives: energy storage for network support and commercial applications of energy storage ( as part of the TVCC energy seminar). The morning session aimed at the energy storage for the network support. Nigel Bessant (Scottish and Southern Electricity Networks) have set the scene for the network support session by presenting DNO’s perspective on the energy storage and gave a brief overview of existing innovation projects involving energy storage. Dr Timur Yunusov (University of Reading), Gideon Evans and Josh Martin (Scottish and Southern Electricity Networks) presented on the development and control of battery energy storage within the NTVV project. Gideon and Josh gave an overview of the project, focusing on the specification requirements for the Energy Storage and Management Units (ESMUs), learning points from the installation and commissioning of the units at the street level, and from the integration of control system into the existing IT environment. Timur focused on the automated control system for the ESMUs, providing the overview of the control methods and results from the trials of control methods on ESMUs installed on LV feeders. “European countries have promoted through different incentives the use of residential-scale photovoltaic (PV) systems resulting in a significant number of installations in LV networks. However, since LV networks are traditionally designed to cope with demand without controllable elements, with higher PV penetration levels, technical problems such as voltage rise or thermal overload of assets are expected to occur. Indeed, distribution network operators (DNOs) are now required to either proceed with costly network reinforcements (e.g., upgrading transformers, conductors) or transit towards the active management of LV networks which can be an attractive and cost-effective alternative. The TVCC seminar had a great combination of speakers, representing industry, academia and investors. Audience from the 4th LV workshop was joined by members of the TVCC and the representatives from industry interested in commercial applications of energy storage. The first presentation was by Dr Ben Potter (University of Reading) on energy storage research highlights. Ben described recent developments in energy storage technologies and costs, followed by two examples of energy storage applications (reducing network connection costs and frequency response). Ben also highlighted that other key factors (i.e. control methods, security and forecasting) play an important role in ensuring that the application of energy storage is successful. Nigel Bessant (Scottish and Southern Electricity Networks) presented on the role of energy storage from DNO’s perspective, described the importance of energy storage performance and gave a couple of examples how energy storage could perform a key role in DNO to DSO transition. Dr Matthew Rowe (DNV GL) gave an overview of energy storage on the global stage, highlighting the idea that energy storage could be seen as a disruptive technology with a potential to provide a wide range of applications. Dr Marek Kubik (AES Corporation) presented on the frequency response application of energy storage at the Kilroot power station, which proven to be more effective than conventional plants in delivering frequency support. Neal Kalita (Energy Locker) gave an insight from developer’s perspective into the investment process for energy storage, highlighting the key factors to be take into the account and the key stages in the process of decision making for the energy storage investment. This entry was posted in Accreditation, buildings, CIBSE, climate, conferences, design, embodied carbon, energy, informatics, materials, Meet Our Researchers, News and Events, sustainability. Bookmark the permalink.